In the “old days” what happened at a portrait studio is that you were told to sit still and be quiet. It’s not like that today! 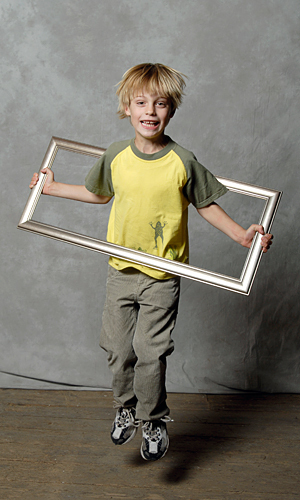 A portrait studio, or a location portrait shoot, is a place for fun and movement. Given that it’s now Spring, it’s time for some Springing about. Here’s a studio shot of a boy jumping; he’s clearly having fun. We were exhibiting at a show in Coleshill, and set up a temporary studio in a converted grain loft. The picture frame he’s “wearing” was linked to the theme “Put yourself in the frame”. Kids have got that energy, so why not use it? 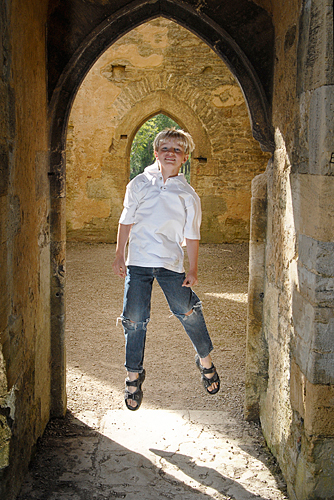 This jumping image was taken during a family portrait shoot on location at Minster Lovell House in Oxfordshire. The morning light coming through the ruins was fabulous, but I still needed a pop of fill in flash to light his face properly. 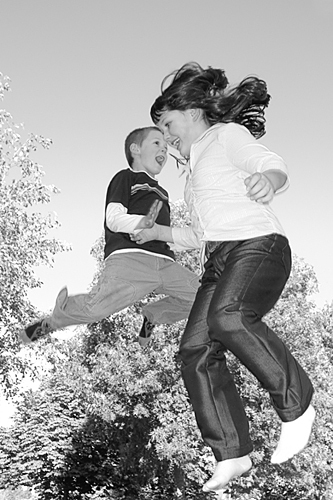 This jumping image, on a location portrait shoot, used an aid to jumping; a trampoline. It meant the the kids were really high up so I could use a low angle, which made them look even higher. Once again I’ve used a pop of flash to ensure their faces were lit well. This final jumping image is at our photographic studio and garden in Oxfordshire. I was down below a terrace wall in the garden which gave me a lower camera angle. I asked the girls to kick their legs under them. Combined with the low angle this made them look really high up. Why not come along for an energetic* photo shoot with us. Just call 01793 783859 to book. * You can be relaxed instead if you want, it’s still fun!